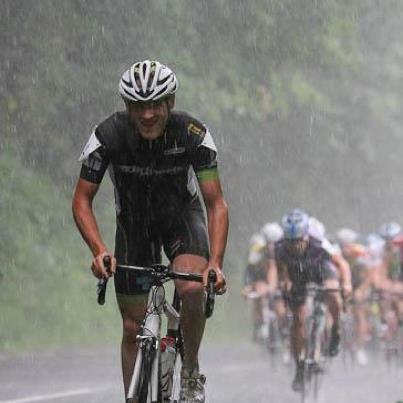 Tips for racing in the rain. Allow for longer braking distances. Dry the wheel rims by applying the brakes ahead of time. Even if the ground is not slick, wet rims will reduce performance. Brake more gently on slick surfaces and use the rear brake more than the front. Turn and accelerate more gently to prevent sliding on slick surfaces. Reduce the pressure in your tyres slightly. Pay special attention to metal and other slick surfaces, such as manhole covers, painted traffic markings, wet leaves and oil slicks. Avoid running through puddles when you cannot see the bottom. Puddles can often hide deep holes. Keep warm, Once you are wet you will soon become cold. Use a race cape to stay dry or put a water proof layer under your race jersey. Use overshoes to keep your feet dry. Leg warmers can keep your legs warm until they become wet, then they soak up the water. consider using vaseline on your legs to repel the water. Good water proof gloves will help keep your fingers warm. After riding in the rain, lubricate your bike chain to help prevent rusting.